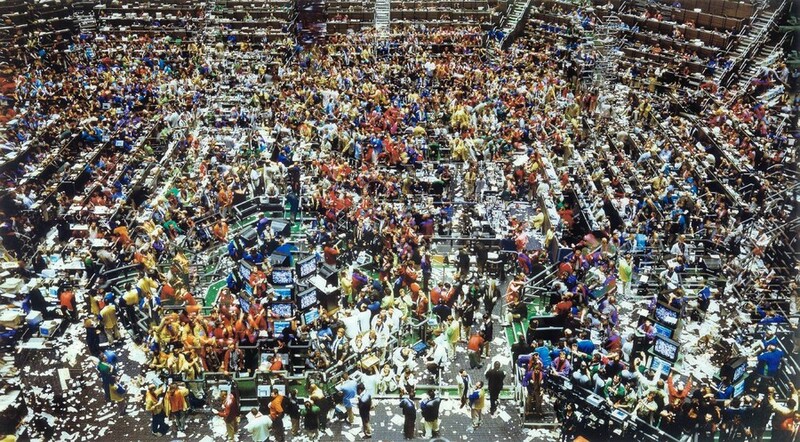 Andreas Gursky’s “Chicago Board of Trade II”, 1999. The artist is shown in the third row, second from left. A sole bar patron restlessly checks his phone for a message that may never come. Police form a barrier around an intersection with their squad cars. Some pedestrians attempt to steal a glance at the cause of the commotion, while others walk onward, unflinching. Newspapers are whisked along a dizzying network of tremendous metal printing machines. Jarringly disparate in nature, these scenes are but a small fraction of the many quotidian yet disaffected scenes that comprise Sarah Morris’s disconcerting new film Chicago. Serving as the centerpiece for the Museum of Contemporary Art’s newest exhibition, CITY SELF, Chicago offers museum patrons an “outsider’s perspective” of the Windy City. The film is the latest and 10th overall edition in Morris’s series of portraits featuring different major metropolitan areas around the globe, beginning with 1998’s Midtown, a probing look at New York. Essentially a 68-minute assemblage of loose visual vignettes paired with a haunting and often dissonant electronic soundtrack, Chicago feels like a fevered, anxious daydream. Throughout the entirety of the work, the only sounds are those of the score, which from the outset helps to create a surreal atmosphere out of the otherwise ordinary. A recurring motif in Morris’s work is capturing the Chicago skyline from disorienting and often dreary perspectives. Familiar buildings such as the John Hancock Center become strange, shadowy monoliths dominating the landscape. This is emblematic of the work as a whole—Morris goes to great lengths to dismantle the tourist-friendly presentation of Chicago and offer a version that instead feels decidedly paranoid. A poignant example is the work’s approach to what would otherwise be a picturesque summer day at the beach. The sun is shining and children are playing, but this scene is in the distance. The foreground of the shot is dominated by officers wearing bulletproof vests on horseback and the periphery is dotted with litter. As with the rest of the film, there are no organic sounds, only the discomforting drone of the machine-like score. In a similar sequence, Morris films the extravagant lobby of an unknown downtown office. The camera’s gaze fixates squarely on a security checkpoint, complete with a metal detector and attack dog. Disinterested passersby come and go, but the focus remains centered on the vigilant security guards and their salivating German Shepherd. In this way, Morris demonstrates a knack for turning what would normally be subtle uneasiness into a flagrant elephant in the room. The brilliance of the work, a trait shared by Morris’s other films in the city series, is its ability to emulate general feelings of anxiety, discomfort, and unfamiliarity that transcend the specifics of the city that it portrays. The emptiness of a specific industrial alleyway off Lower Wacker not only feels particular to that place, but reminds the viewer that, under the proper circumstances, one can feel like an “outsider” anywhere. CITY SELF will be at the Museum of Contemporary Art Chicago through April 13.